Most of Fuel CMS’s functionality is packaged into modules. A Fuel CMS module contains at least one model with an accompanying database table and can be extend with controllers and views. In the MVC pattern, models are classes that define different data fields and are used for working with the data stored in tables. For more information about models in CodeIgniter (the framework which Fuel CMS is written in), see the framework’s documentation. In a default Fuel CMS installation, standard modules are included by default. For example, the blog system is built up from three modules: Posts, Categories, and Authors. Each of these modules has its own table in your database. 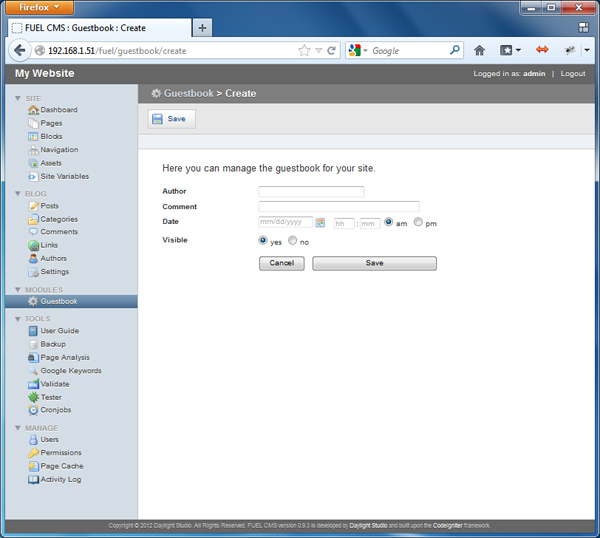 In this article we’ll be creating our own guestbook module. Everyone can post new comments and an administrator can moderate them through the administration menu. Start with creating the directory modules/guestbook. From now on, I will refer to this directory as the “guestbook folder”. The purpose of each column should be clear based on the names; the table stores guestbook comments with the comment author’s name, the date, and whether the entry is visible or not (the visible column is special to Fuel CMS). This is just the basis for our module. GuestbookComments_model extends the Base_module_model class which will handle our listing and administration interactions automatically. The string passed into the parent constructor is the name of the database table this model will use. GuestbookComment_model extends Base_module_record which handles working with individual records. If you want you can test it out and see if it works, log in into your dashboard and select ‘Guestbook’ from the Modules submenu. Normally there would be a list of comments, but as we don’t have any data yet the list is empty, so click on the Create button to add one. When you return to the list, you should see the comment you just added. As more and more people will leave comments in the guestbook, this is the place where you’ll go to moderate them and keep your guestbook free from spam. This is all very cool and such, but you obviously don’t want to be the only person able to add comments! We need to create a controller to handle the public-facing actions. You can access controller actions by using the controller name and then the action name in the URL. So, to see the view, navigate to http://localhost/guestbook/view (or whatever your development address may be) in your browser. Most of the code used in the controller is CodeIgniter except for the module_model() method. The first argument is the name of the modules directory, in our case ‘guestbook’, and the second argument is the name of our model class that extended Base_module_model. Now when we go to http://localhost/guestbook/add we should see the form. We used Fuel CMS’s form builder to give everything a nice, clean look and avoid writing the HTML ourselves. We first load the form_builder library and then pass it some arguments to define the properties and elements of the form. Check the documentation for a full listing. We load the guestbook model, assign the incoming data to its members, and then save it to the database. Finally, a success message is issued that says everything has been added to the database. As you’ve seen, Fuel CMS doesn’t provide pre-packaged solutions for many things like large CMS platforms do; a lot is left up to you as a developer. But luckily, it’s not hard thanks to the CodeIgniter framework and Fuel CMS’s helper libraries.